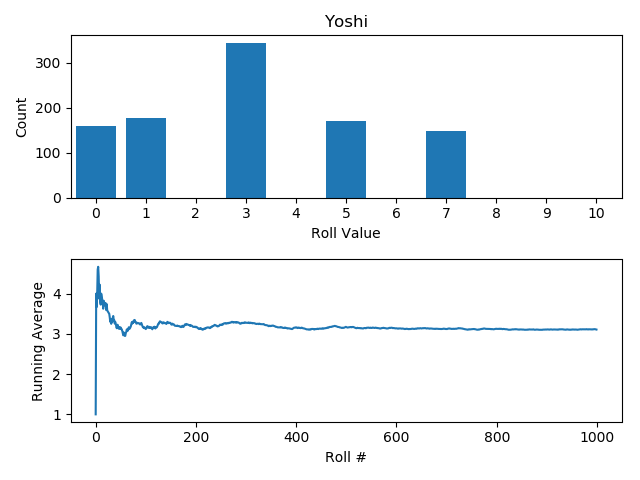 Actually, to be honest, the question I was specifically wanting to know the answer to and also answers the above was: what is the expected value of each of the dice? 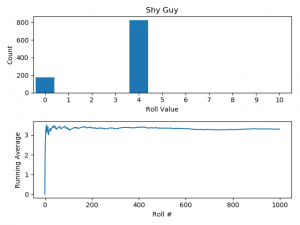 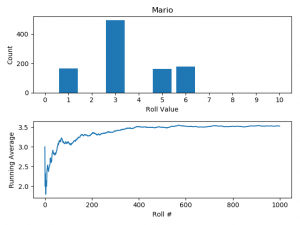 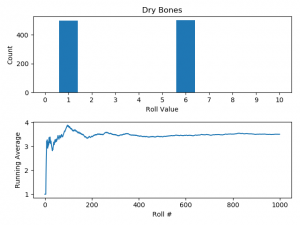 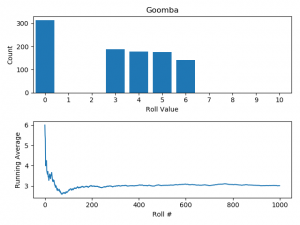 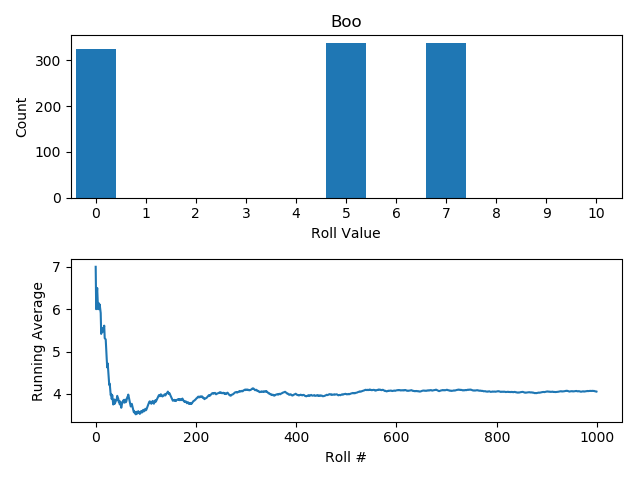 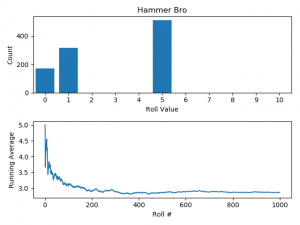 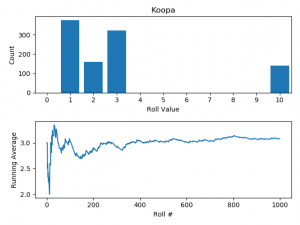 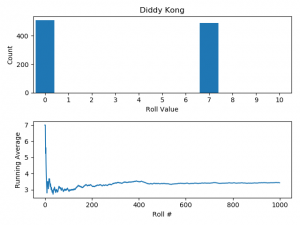 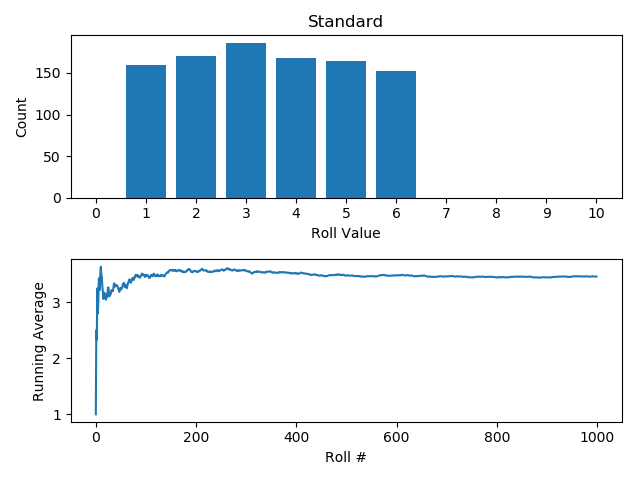 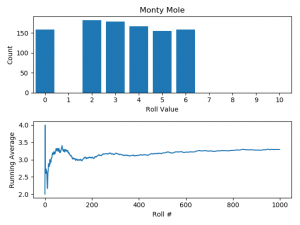 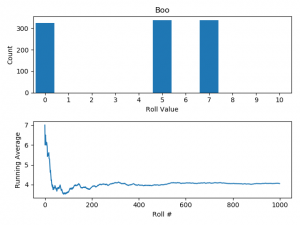 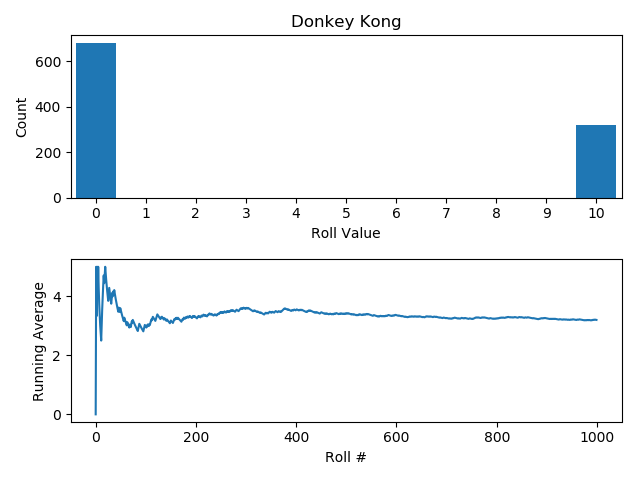 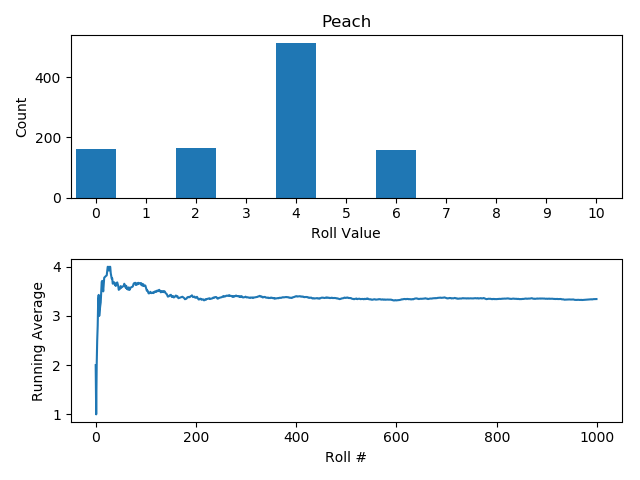 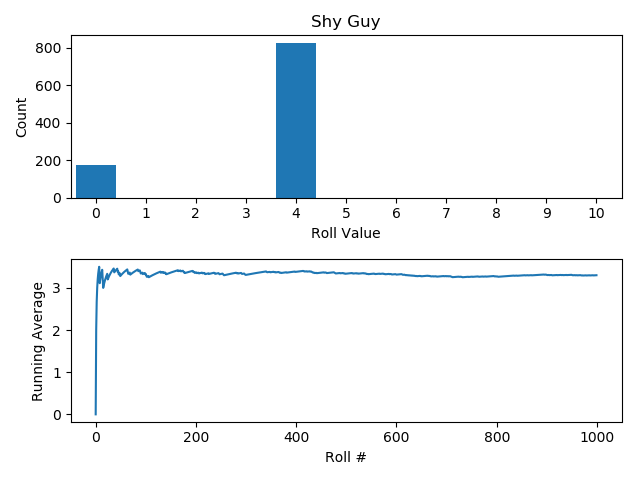 Put simply, expected value is the average value of an action with a random outcome (in this case, the roll of a six-sided die) over a very large number of repetitions. For a random variable with a finite number of possible outcomes occurring with probabilities , what is the average value of for trials as ? 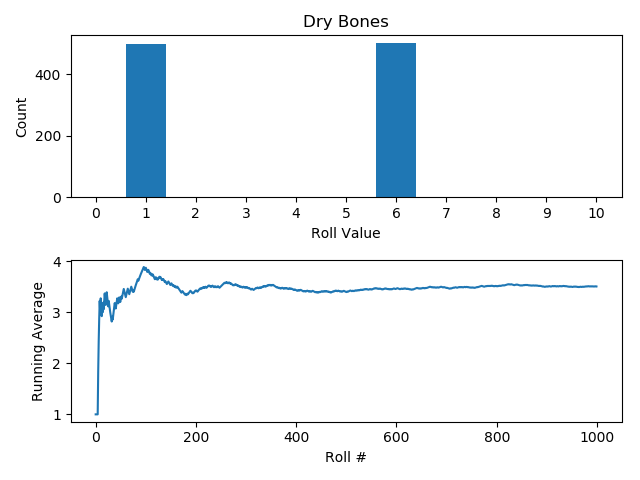 Which as you can see is just the weighted average, and in the case of a regular die, since all sides are equally probable, is just the simple average (sum of sides divided by 6). 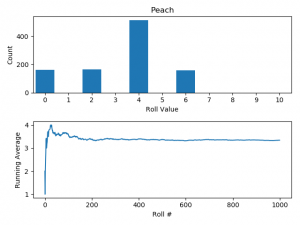 So over many, many rolls, we’d expect the average to converge to be 3.5. 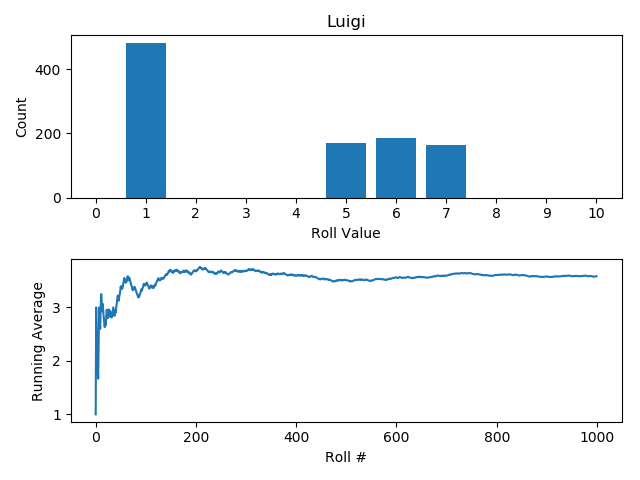 Now let’s take a look at the dice of the Mushroom Kingdom, shall we? 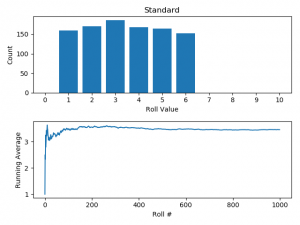 You can see that most of the dice on average, are actually equal or worse than the standard die – however, the offset to this is that many are giving the player coins instead of movement (and in some cases it is actually advantageous to remain in the same spot). 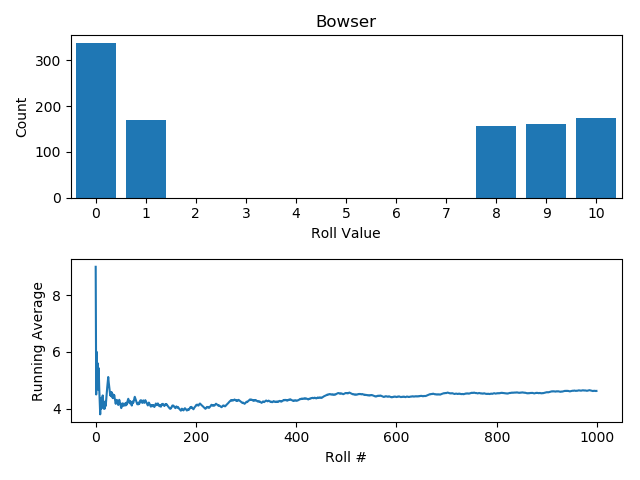 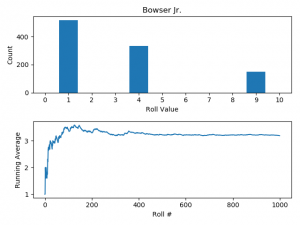 Overall, if you want to move many, many, spaces in the long run you’re best using Bowser, Wario, or Boo’s dice. 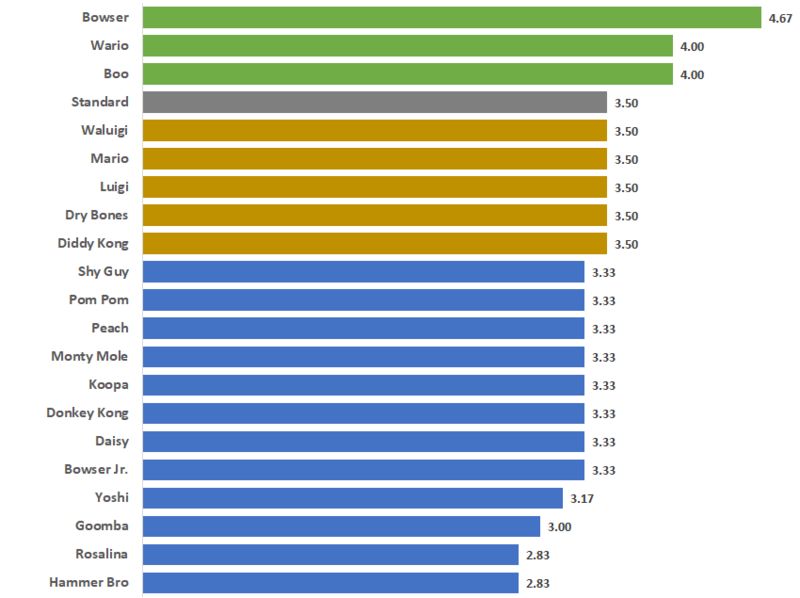 This is consistent with the top of RankedBoost’s rankings, other than for Donkey Kong, which is ranked quite lower since we are not considering coins. 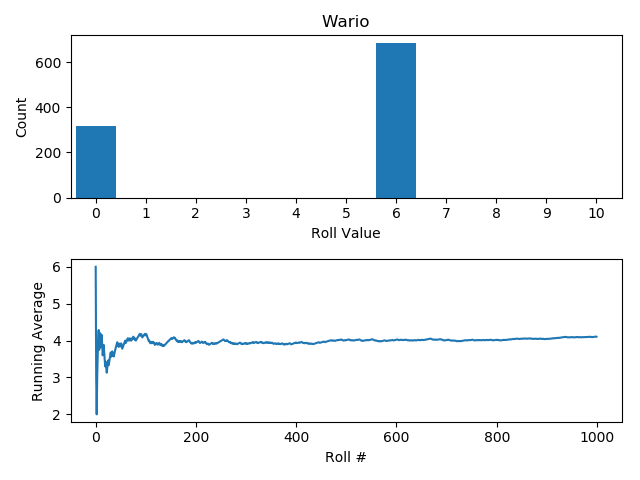 From the plotting function we get the following output for each of the characters below. The convergence to the expected value would be different each time the simulation is run (since it is random), however you can still see by the range of the y-axis for the second plots that the range is quite narrow for some dice and wider for others. 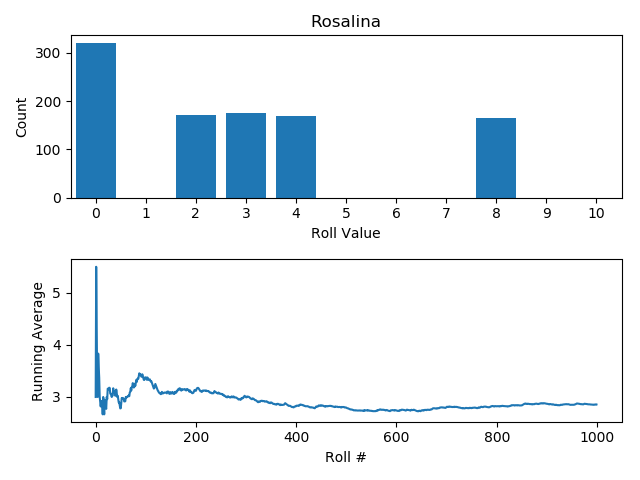 You can see that some converge quite quickly, and have a narrow range when there are only a few values or values close together (e.g. 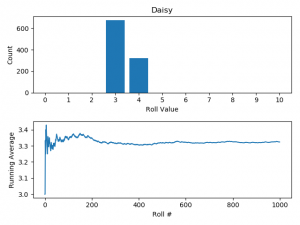 Daisy) whereas others with a wide spread between values or many different values converge a slower (e.g. 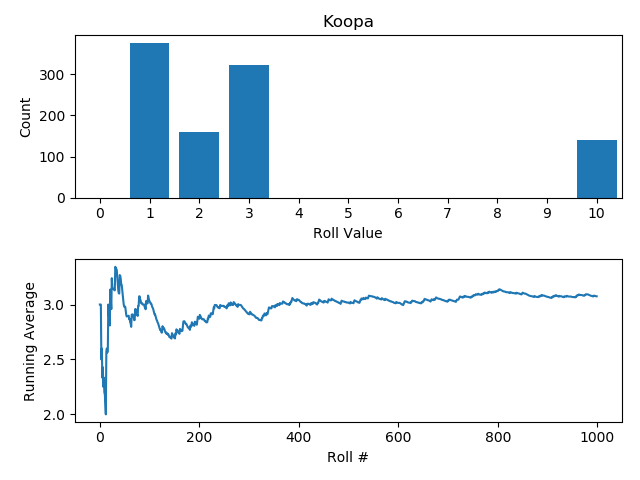 Hammer Bro, Koopa). 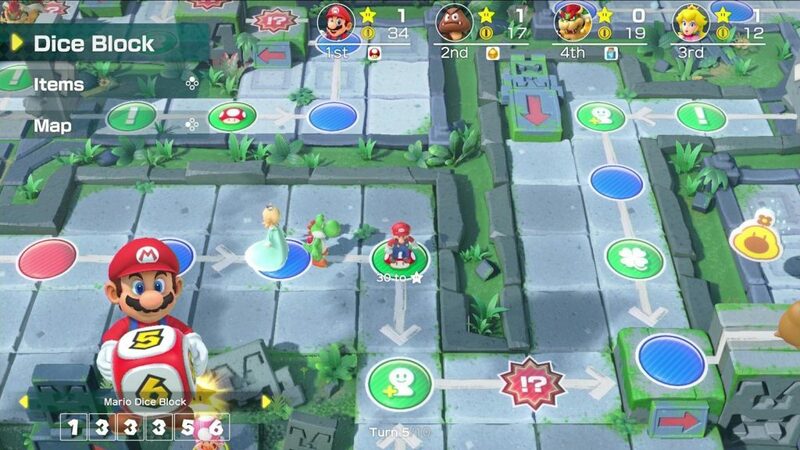 So, are the dice in Super Mario Party ‘fair’? That is a resounding no. 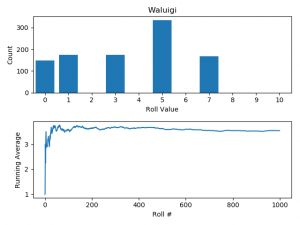 However, I suppose we shouldn’t expect them to be, given that they are likely designed to have their advantages and disadvantages to make the game more interesting. 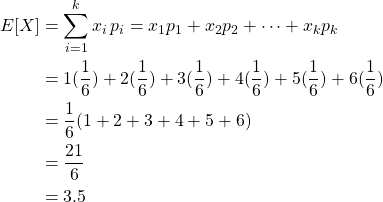 That being said, there are some that are noticeably much worse as others have already noted (e.g. Hammer Bro, Yoshi). 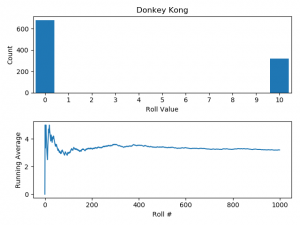 And, of course, as with any statistics there is the usual proviso – the behaviour on average in the long run is often very different from the here and now you care about, and it really all depends on what outcome you’re after. 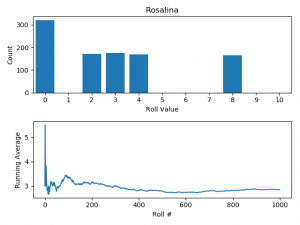 Previous Previous post: Are We Solving The Wrong Problems With Machine Learning?